Natasha: Barnes? We need to talk. I’ll start. First, thank you for the assist. Clearly, Recluse has been training since we last met. Bucky: We make a good team. You must remember that much. Natasha: Now, lets move on to the parts that insult me. Have you really been keeping an eye on me for a while? Natasha: I don’t need you to be my keeper, Barnes. Please tell me there’s more to your presence than that. 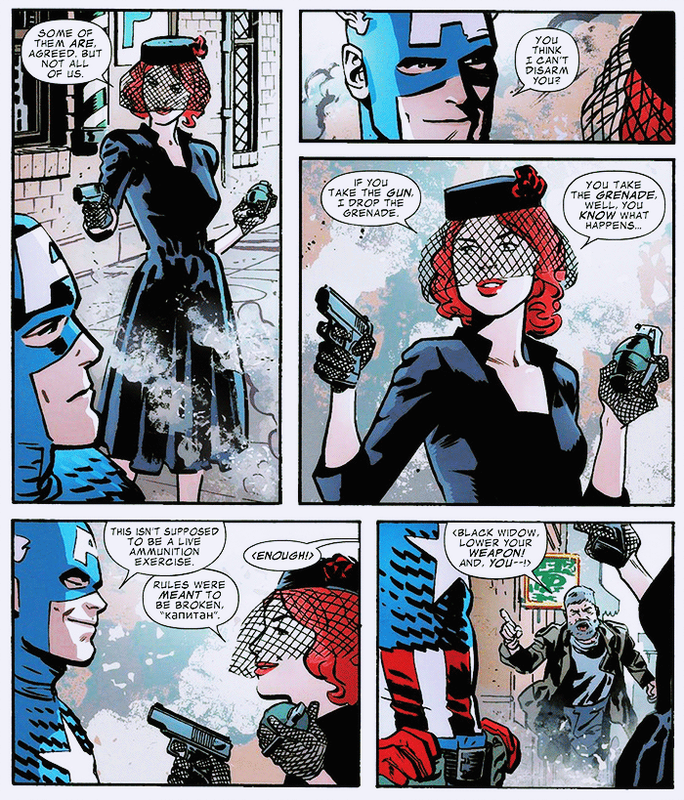 From Black Widow #9 by Chris Samnee and Mark Waid. 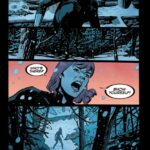 Preview: Black Widow #9 on sale 12/28/2016. 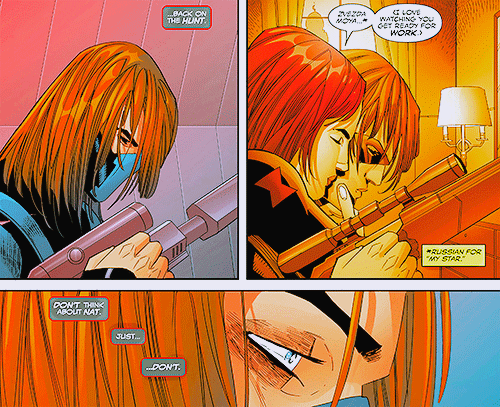 did u see the buckynat tease in thunderbolts #6? Natasha: Zvezda moya… I love watching you get ready for work. It’s… kind of an odd scene to me, tbh, since I don’t think Natasha’s attraction to Bucky/Winter Soldier was ever how good he is at killing people, even back in the USSR. Really the opposite. But at least we now know Bucky’s hair is officially longer than it was when he was brainwashed. It’s important to keep track of these things. 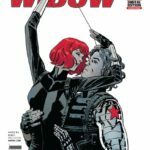 Posted on October 20, 2016 Tags shippy stuff, thunderbolts, winter soldierLeave a comment on did u see the buckynat tease in thunderbolts #6? do you think natasha will ever get her memories of bucky back? or do you think marvel is just against it. thx. Marvel isn’t “against it” and never has been. But there are a lot of coincidental things that have kept it from happening. From what I understand, originally Widow Hunt was supposed to be a three part mega-arc that ended with Natasha having her memories back. 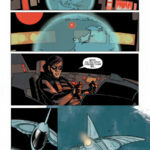 But the book got cancelled midway through and so Brubaker awkwardly rushed an ending into the second act. Then Winter Soldier got un-cancelled, but Brubaker had already made non-Marvel plans and didn’t come back. 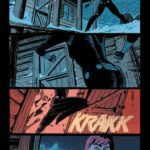 When Jason Latour came on he, understandably, wanted to write his own story and not step all over Brubaker’s intended conclusion. And then the book got cancelled for real, and that was that. So this was never meant to go on like it has. It also doesn’t make much sense as a long-term plot point. I don’t think it will last forever because it cuts Natasha off from one of her more significant relationships for no reason. 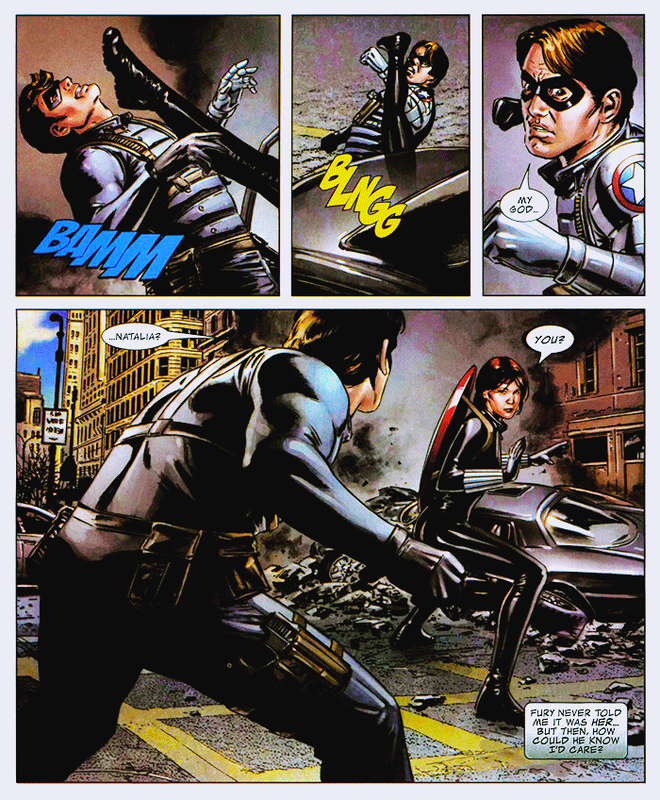 People are still interested in the Bucky/Natasha pairing; Brubaker’s Captain America stuff where it features is still seen as a modern classic that inspired some of the MCU’s better films. It’s not falling into the “let’s all pretend this never happened” soft-retcon category like some other recent Bucky directions. But the same editorial hurdles and creative hurdles that resulted in the storyline being fucked up in the first place are still in play. 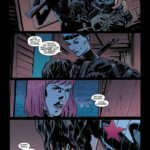 Marvel is still interested in pushing Bucky and Natasha as characters, but their specific ideas for Bucky have been pretty far removed from the character-driven espionage that Brubaker started out with. 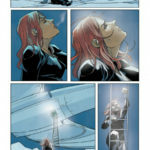 And the creative teams who have handled Natasha have been (understandably!) more interested in developing their own plotlines for Natasha than returning to bad old ones. Thunderbolts needs to be about the Thunderbolts first, and the ongoing drama of the Marvel universe second. Fixing a broken plot point from several years back is going to be way down on the priorities list. The current cycle of endless relaunches, moreover, means that books are forever re-establishing their status quo, with less time to visit dangling plot points. Furthermore Bucky and Natasha are both being promoted individually, not as part of a set. 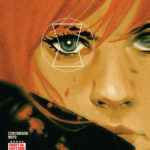 It’s hard to see a Winter Soldier writer being given the creative freedom to use Natasha the way Brubaker did— and that was unusual even at the time, something grandfathered in from 2007. 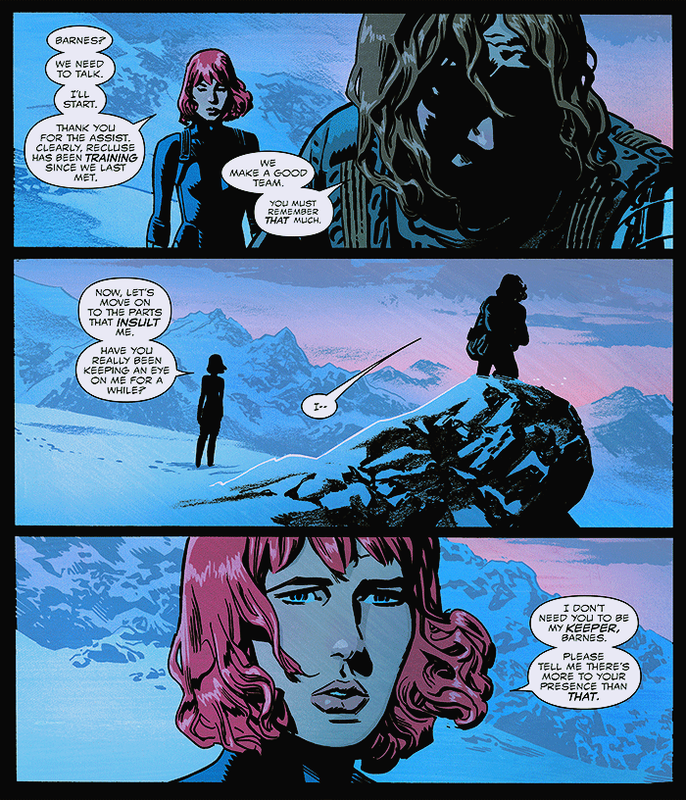 It’s likewise difficult to see a Black Widow creative team being able to use Bucky freely. He’s already being used. And this probably isn’t going to stop so long as Marvel has a specific interest in developing these two properties. So any extended plotline involving the two of them is going to need to clear the approval of two editorial offices. 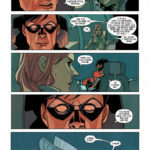 You don’t need an extended plotline to fix this mess, but any throwaway line revealing Natasha’s memories of Bucky are back is going to be a confusing one to the current-day readers who aren’t familiar with Winter Soldier #14, which is most of them. And the longer this goes on the more obscure this plot point gets. 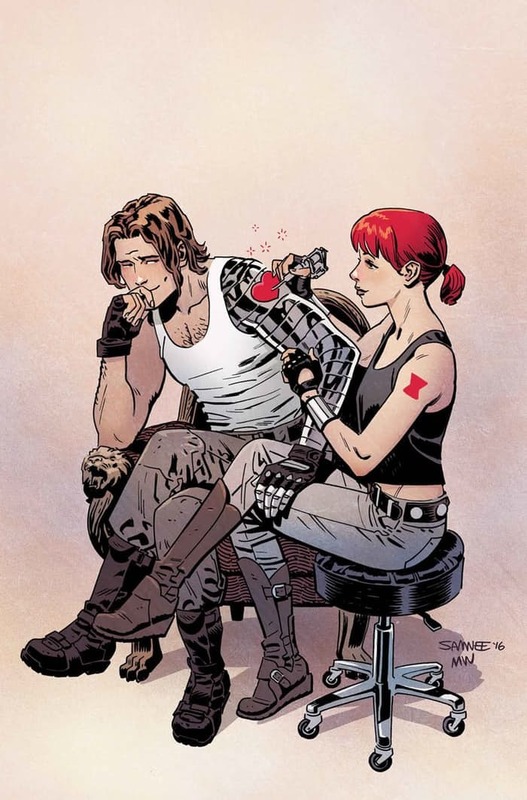 Like I said, I think that eventually, someone will want to write a story about Bucky and Natasha enough that they’re willing to jump through all the hoops necessary to make it happen, and the timing will eventually be right and not thrown off by a superimposed schedule of tie-ins and mega-events. But there are real obstacles and reasons why they don’t fix this plotline every time they could. Posted on August 19, 2016 Tags (kinda), questions, shippy stuff, winter soldierLeave a comment on do you think natasha will ever get her memories of bucky back? or do you think marvel is just against it. thx. Bucky: Now that we’re on the ground, the question is… who does Stark trust enough to transport that shield on their own? From Captain America #27 by Ed Brubaker and Steve Epting. Preview: Black Widow #18, on sale 5/27/2015. Nrama: On the other hand, you’ve recently introduced some other superheroes into the series with Daredevil in Issue #7 and the Winter Soldier in #8 playing upon Natasha’s shared history with each individual. Can readers expect to see Matt and Bucky again – or other characters for that matter? Edmondson: A “perhaps, yes, probably, yes” to both, so far as we can see ahead into the future of the series!